In the meantime we enjoyed the sprawl of London. 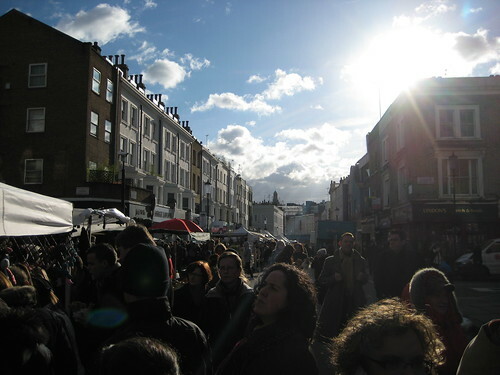 The picture above and below is from the Portobello Market in Notting Hill. As you can see it was a great day for strolling and the market was bustling with people along the almost two miles the road stretches. 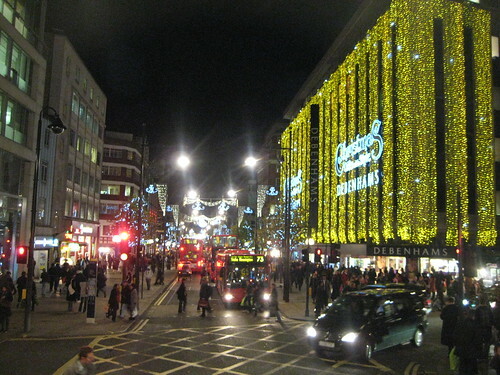 London is getting into gear for the Christmas shopping and and there where lights up a lot of places. Here we make our way down Oxford Street, the big shopping street, in a painfully slow tempo. Looking at the city as it slowly sail by makes up for it. Saturday night we went to Camden Town to meet up with Jamie and Becky who used to live in Prague. They went back to London. 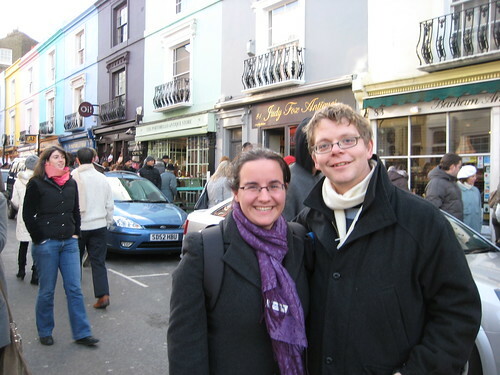 (It was Jamie who had advised me on my Scotland itinerary and his parent’s house I stayed at in Glasgow). Jamie is a folk musician so we went out to hear him jam at a very local bar called The Golden Lion. It was good to see Jamie and Becky again and to hear their take on London. 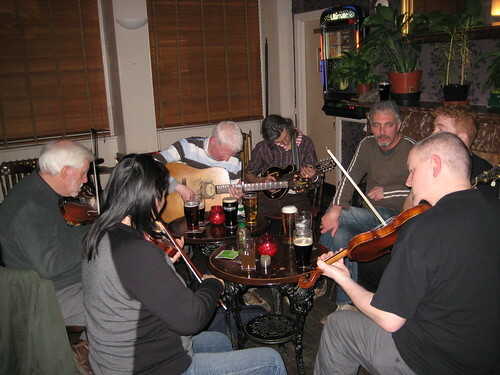 Jamie is at the back of this picture in stripes – this night he was playing violin, flute and guitar. While I was there I borrowed cousin Martin’s flat which was very appreciated. Ann has a lot more details about the weekend at her blog. The weekend was over fast and I’m now back in Prague. This entry was posted in Trips to England and tagged ann, becky, camden, christmas, friends, jamie, meetin by michael. Bookmark the permalink.